Shogi is a Japanese board game for two players, played on a 9 x 9 grid. 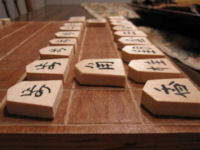 Shogi is also called "Japanese Chess", and is closely related to both Chess and Xiangqi (Chinese Chess). It has been played in Japan since the 16th century. Each player starts with 20 wedge-shaped pieces – 1 king, 1 rook, 1 bishop, 2 gold generals, 2 silver generals, 2 knights, 2 lances and 9 pawns – in fixed starting positions. The object of the game, just like in international chess, is to checkmate the opponent's king. Shogi is the only chess variation that uses the "drop" rule, in which an opponent's captured piece can be dropped back onto the board as one's own, which can allow momentum to quickly shift back and forth between the two players. Refer to the complete rules for further details and instruction. 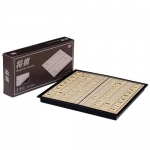 This quality Shogi magnetic set is small enough to travel and large enough to play comfortably. Your pieces will stay in place on the board wherever you are playing. It is an inexpensive way to get started with Shogi, as well as a great way to take you game on the road! This is the ultimate book on shogi for beginners and experienced players alike. Its step-by-step instructions and easy-to-follow diagrams lead the reader through the strategies and intricacies of one of Japan's most popular board games. This essential resource includes a shogi board bound right into it, folding out for use with the included shogi pieces. By Trevor Leggett. FESA encourages the diffusion and development of the game of shogi among all nations of Europe, and supports the spread and popularization of shogi in Europe. A series of instructional videos that will teach you how to play Japanese Chess, Shogi. Lessons are in English. The aim of the International Shogi Club is encourage players to learn from each other and information exchange on Shogi. The official organization of Shogi players in Japan. Play Japanese Chess (Shogi) for free with this Java applet. Play Shogi online on this free web site, against players from around the world. Shogi.net is a portal to the wonderful world of Shogi, with a Shogi forum, Shogi links, Shogi rules, and information about Shogi variants. A list of Shogi games played on small boards, with rules, links, and strategy tips. Shogi history, rules, and links from the free online encyclopedia.